Taking a remarkable approach to a real-life tragedy, the setting of stage-to-screen adaptation London Road, from Rufus Norris (director of the original stage production), is the titular Ipswich street on which five women working as prostitutes fell victim to serial killer Steve Wright in 2006. In the aftermath, writer Alecky Blythe interviewed the road’s residents and, together with composer Adam Cork, turned the resulting verbatim dialogue – hesitation, repetition and all – into an astonishing musical screenplay. Far from being a gimmick, this method of storytelling feels entirely fitting for the deep-rooted social issues being explored. Rather than simply bursting into life, the songs emerge from everyday speech, exposing the truest feelings of the characters. And while the soundtrack of their lives is initially composed of the staccato beats of paranoia, suspicion and fear, as the community comes together it swells to encompass relief, redemption and pride. Visually too, cinematographer Danny Cohen's framing and editor John Wilson’s cuts replicate the organic rhythm of speech that so effectively informs the music, while the exceptional cast – which includes Olivia Colman, Tom Hardy, Kate Fleetwood and Anita Dobson – shoulder the controversial material with essential plausibility. This sense of integrity extends to the film’s compassionate treatment of the prostitutes themselves. Their predominant silence speaks volumes about their social exclusion and when they are finally given voice, with the heartbreaking ‘We’ve All Stopped’, it is a sucker punch reminder of their ongoing fight for survival. The uncertainty of their fate is further compounded by the use of Blythe’s original interviews over the end credits; that this directly precedes a reprise of the residents' rousing ode to their petunias is an eloquent precis of the film’s power to both celebrate the healing power of community spirit and expose the ‘not in my backyard’ prejudices that often lie behind such action. 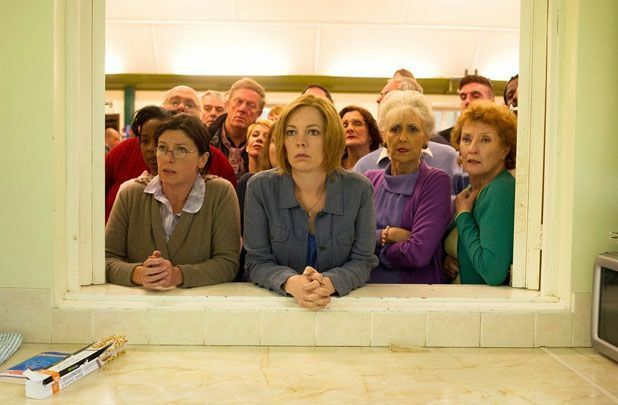 A bold, inspired and entirely unique piece of British cinema, London Road is absolutely unmissable. Premiere on Tue 9 Jun via NT Live. General release from Fri 12 Jun. Musical set on the titular Ipswich street where a serial killer killed five women in 2006. Writer Blythe interviewed residents and composer Adam Cork set the resulting verbatim dialogue (hesitations and all) to music, making for a bold, inspired and entirely unique piece of cinema. Unmissable.